Cherry limeade, made with lemon-lime soda, cherry syrup, a splash of maraschino cherry juice, and fresh squeezed lime juice, is a refreshing and delicious summer drink. After that nice little cool spell we had, it sure has warmed up here in a hurry on the Coast. And with all that rain, it's left behind a lot of humidity. Already. Perfect weather for one or three of these. The homemade sno-cone syrup I shared recently is what I use to make these, and while I am not even going to try and say that this is a copycat of the beloved Sonic cherry limeade, personally, I like mine better. You can, of course, use any commercial syrup and I've left a few suggestions in the recipe. Crushed ice is the key! Crush your ice, whether you use an ice shaver, a good blender, or simply pile a bunch of ice cubes in a clean dish towel and use a mallet with your own elbow grease - but definitely crush your ice. This classic is intended for crushed ice y'all. Single serve is the way to go. I thought of increasing ingredients to post this as a whole pitcher, but frankly, I think a cherry limeade is meant to be made by the glass, like you would have gotten at the soda fountain from the local drugstore. It just seems right. Oh my gosh does that photo bring back some memories. 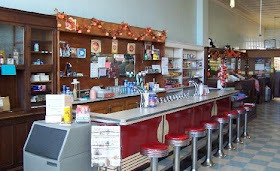 I swear that could be the soda fountain at the old Calvert-Carraway Drug Store on Pass Road. It even seems like the same floor. Sure makes me want one of those big, fat hamburgers they made, with a big pile of onion rings or fries on the side and a cherry coke. Anyway... in all fairness, even though I think you ought to make these by the glass, I doubt you could stop at just one really. These are refreshing. Delicious. And downright addictive. I can't tell you how many of these I have made in the past couple of weeks, not only because the number is downright shameful and embarrassing, but mostly because I've lost count. They are just so darned tasty. For more fizz go with the cans! This mixture is based on a glass about 12 ounces in size, so if you're using a larger sized cup or glass - say like a big Tervis Tumbler - you'll want to make adjustments accordingly. Just keep your glass size in mind. I won't tell anybody if you sneak in a splash of vodka or rum for cocktail hour either. Here's how to make a refreshing cherry limeade. 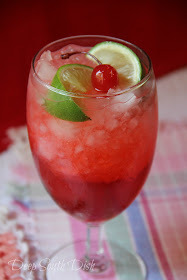 Add cherry juice and syrup to a 12-ounce glass and top with lemon-lime soda to fill glass about halfway; stir to blend. Fill glass with crushed ice, top off with additional soda, if needed, then squeeze two lime wedges in and drop them on top; add a maraschino cherry and straw. Cook's Notes: I have used 7up, Sprite, Sierra Mist Natural and a homemade sparkling water (below.). Good choices for commercial cherry syrups are DaVinci, Torani, Hawaiian Shaved, Juicy Juice and other snow cone brands of syrup. If you want to go for a pitcher, a 1/2 gallon is 64 ounces, or a little more than 5 of these 12-ounce glasses. Homemade Lemon-Lime Sparkling Water: Zest one lime and mix 1/2 cup fresh lemon juice and 1/2 cup lime juice (about 6 small lemons and limes) with 3/4 cup sugar. Add sparkling water (I use my Soda Stream) to make a total of 5 cups; mix well. Shirley Temple: Pour one ounce of grenadine over ice in the glass and top completely with lemon-lime soda. Top with stemmed maraschino cherries. Roy Rogers: Pour one ounce of grenadine over ice in the glass and top completely with cola. Top with stemmed maraschino cherries. I learned to love the cherry limeades at Sonic when I was in Oklahoma and any other point south when I could get to one. We only have on Sonic out here in my area of Southern CA, and it's not close to me. I will be giving this a try real soon!! Thanks so much, Mary. You're so welcome - enjoy!! My mouth is watering! I love lime and i love cherries, so this must be delicious! Me too Eva and these are so refreshing! Oh boy, this looks so refreshing Mary! Last week was so warm and humid here, and this drink would have hit the spot. So I'm bookmarking for the summer blast that will soon be here. Oh my goodness, went out and about running errands today and thought I was gonna pass out! Gonna be a hot hot summer Lynda. I HAVE to make this for Alexis, she LOVES cherry limeade! Now I'm thirsty! LOL! Stopping at the store on the way home tonight! Favorite. Drink. Ever! Looks great! Having a kids b-day party. Just because of the mass numbers of children anything you think I could use in place of the cherry juice? This would be great to make but those darn containers don't have much juice in them! Grab a bottle of grenadine from the mixers at your store - it'll work great! Hey Mary this brings back such sweet memories from when I was little and we would go to my grandparents down in TX. As soon as we rolled into town we would go to the Mr Burger and get us some really good burgers and Cherry Limes- So so good! They really are aren't they?